Today we are going to tell you “How to Speed up Android” using some best applications available in android market. Android is the best operating system in the world and it’s applications make it more powerful. If we talk about android Phone’s performance and its battery life, obviously it will meet all the expectations. In the world of rapid technology, two things are mainly required by all the users of smart phones, one is performance and another is battery life. We all knows that android phone’s performance and its battery life are decides the power of an smart phones, but there are some apps also available in android market which can make android performance better. So today we are going to tell you how to speed up android using best applications. Here we are going to tell you about 5 best applications to boost your android performance, let’s have a look how to speed up android using these apps. Du Battery saver pro & Widget is the best battery saver for android, it has many features such as “Intelligent mode switching”, which automatically switch the mode according to an specific level of phone’s battery. Du battery saver pro & Widget has two versions available on android market one of them is paid and another is free version. Here we are going to provide you the paid version of the application for free, you can download the application from the link given below. Battery Life Repair Pro optimize the performance of battery and make them last longer. New phones have better battery life and they also charge upto 100% of level but when phones became old then charging level considerably decrease and those phone could not charge upto 100% level although phone indicates 100% battery level. Battery life repair pro repairs the phone’s battery and make its performance better, battery life repair pro have also many other features and some of them given below. Battery doctor improve batter performance upto 50% by finding the applications which drain battery level, battery doctor – weather widget support 29 languages which is a major plus for the application. The application provides a detailed information about battery life, condition, power etc. and improve overall performance of the phone. Battery Doctor has 330+ million users all over the world and they believe battery doctor is enough to boost android performance. Battery saver regulates the manner in which the device is charge with 3 unique charging stages to ensure that the battery is not over charge. Overall battery saver is one of the best applications to increase android performance and Speed Up Android, Battery saver also has many other features and some of them are given below. Avast battery saver makes your android battery life even better, with its cool features such as auto standby and smart management of internet connectivity. Avast battery saver is very easy to use with simple user interface, features of the application makes your android experience even better. Let’s talk about avast battery saver features, some of the best features of the application are given below. Overall it has all the features to make boost android performance. 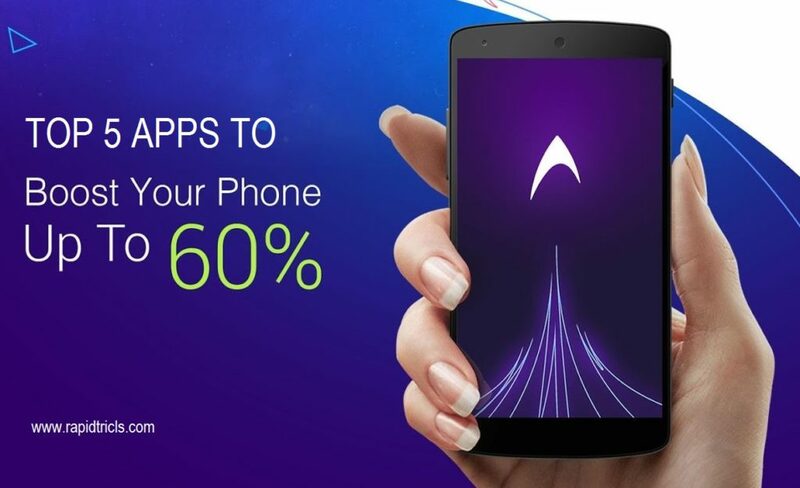 Enjoy the maximum performance of your android smart phone with these top 5 apps. And if someone ask you how to speed up Android then don’t forget to share this article with them. Also share this article with your friends and let them boost their android phones. If you have any query regarding the article, just post the comments below and we will reply as soon as possible. So stay connected with us for more amazing tips and tricks about internet, android, PC etc., and enjoy the apps given above to speed up android instantly.